When was the last time you felt so much joy that you simply couldn’t contain yourself — and had to do a cartwheel to show your happiness?If you happen to be in Dusseldorf, Germany, such an expression of joy wouldn’t be out of place — and you might even have a few others join in your celebration or toss you a few coins in appreciation. 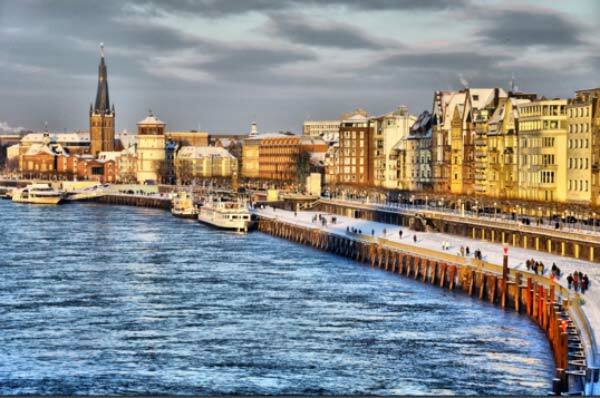 It’s not because the northern city is consistently rated one of the happiest places in the world (currently ranked number 6) or the fact that the city is among the most beautiful and exciting in Germany. No, the enthusiasm for the cartwheel is a longstanding tradition in Dusseldorf, reflected in its art, architecture and even its motto: “We will stay cartwheelers, however crazy the world might be.” When you make your first visit to Dusseldorf, you might be perplexed by the abundance of cartwheel imagery throughout the city, but the gymnastics maneuver has a long and storied history here. 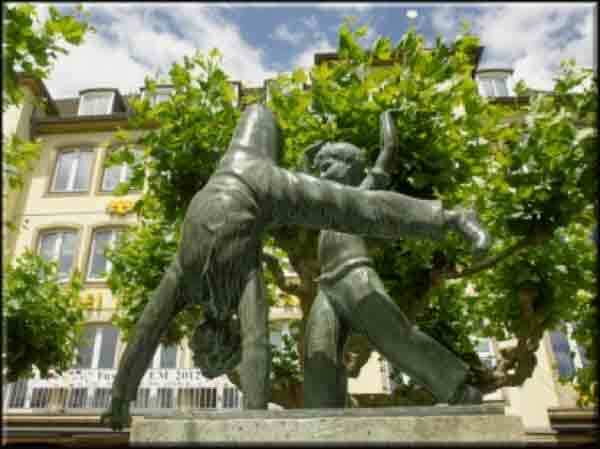 Dusseldorf’s fascination with the cartwheel is believed to date back as far as the 13th century, but there are varying opinions as to exactly how they became so important to the city. One theory pins the cartwheel to the German victory in the Battle of Worringen in 1288. According to the legend, this battle was one of the largest in fiercest in all of Europe during the Middle Ages, in which the Archbishop of Cologne was soundly defeated by Count Adolf. This victory resulted in Dusseldorf being granted town privileges — the ability to establish markets and professional guilds, among other rights — paving the way for it to become the city it is today. After the battle was won and the news reached the people, the story goes that they were so happy that they took to the streets and did cartwheels; in another version, the young boys of the town were encouraged by the Earl of Berg to show their happiness by doing the trick. While the story of victory in war is the most popularly accepted explanation for Dusseldorf’s affinity for cartwheels, there are two other wedding-related legends that have some proponents. According to one version, when two members of the nobility (accounts vary as to whom) were married, one of the spokes in the wheel of their carriage broke, which local superstition claimed would bring bad luck to the marriage. To prevent such a fate, a young boy placed himself in the wheel to serve as one of the spokes — a trick that worked and encouraged others to do cartwheels to ward off bad luck. In the other version of the wedding story, the couple in question was the Margrave Jacobe von Braden and Johann Wilhelm — and the bride was so unhappy with her marriage that the only thing that made her smile was the boys cartwheeling alongside the wedding carriage as it made its way through town. Regardless of its foundation, the cartwheel became an ingrained part of the culture of the city, and by the turn of the 20th century, the city’s young boys had turned their gymnastic abilities into a form of income. Even today, young boys (and even a few girls) will entertain visitors with cartwheels in exchange for a few coins. Cartwheel imagery is everywhere you look in Dusseldorf, from the manhole covers in the streets to the tiny figurines that stock the shelves of souvenir shops. One of the city’s most famous landmarks, the Cartwheel Fountain in Bergplatz in the Old Town neighbourhood of the city, also pays tribute to the movement. But the most enthusiastic expression of cartwheeling in Dusseldorf happens every summer at the International Cartwheeling Tournament held on the Rhine River Promenade. Since 1937, children from Dusseldorf — and now, from more than 15 countries — have travelled to the city to compete in the tournament. Boys and girls ages 8 to 12 race to complete as many cartwheels as possible in a distance of either 15 or 20 metres, depending on age. Competitors are also evaluated on their style, with the most stylish cartwheelers given prizes. This year’s competition, the 65th annual event, will be held on 15 June. The cartwheeler is one of the most enduring symbols of Dusseldorf, a symbol of joy and optimism. Even if you don’t join in and make a few turns yourself, watch out for the cartwheel imagery as you explore the city, and see how many cartwheelers you can spot.